Days before his address to the 73rd UN General Assembly on Thursday, Palestinian President Mahmoud Abbas began a European tour to France and Ireland to whip up support for the Palestinian position of rejecting blatant US bias towards Israel. Abbas arrived in Paris on 20 September for talks with French President Emmanuel Macron on latest developments in Palestine, asking for Macron’s support in creating an international umbrella to sponsor the peace process with Israel so that the US is not left in charge. Abbas’s statements that he is willing to hold “secret or public negotiations with Israel” with international mediation were strongly criticised by Hamas, which described them as “a stab” in the back of the Palestinian people and shows that Abbas doesn’t truly reject the US’s “deal of the century”. At a joint news conference with Macron at the Elysee Palace, Abbas said: “We are prepared for secret or public negotiations with Israel through mediation by the Quartet in partnership with other countries… The Palestinian side never rejected negotiations.” He noted that Israeli Prime Minister Binyamin Netanyahu is the one obstructing talks. Abbas called on the Quartet to mediate between Israelis and Palestinians, and not surrender this role to the US which has taken a hostile position towards Palestinians. The Quartet, which includes the US, Russia, EU and UN, plays the role of mediator between the two sides. Before the news conference, Abbas and Macron discussed conditions in the Palestinian territories, the closure of the Palestine Liberation Organisation (PLO) office in Washington, accelerated settlement building and measures against Palestinians by Israel, according to the Palestinian news agency WAFA. On the sidelines of his Paris stop, Abbas met with former Israeli prime minister Ehud Olmert who asserted Abbas is the only one who can achieve peace with Israel. Olmert was seen sitting next to Abbas in the Palestinian president’s residence in Paris, and spoke directly to official Palestinian television. “Everyone in the US and Europe, and certainly in Israel, must understand two things: first, there is no alternative to a two-state solution to end the Palestinian-Israeli conflict. Second, this solution is possible. And last but not least, that President Mahmoud Abbas is the only person that can make it happen,” Olmert said. Olmert, who served as prime minister between 2006 and 2009 and led political talks with Palestinians for months in the past, said Abbas “is a great political leader, a key figure in future developments and relations between Israelis and Palestinians”. Olmert was released from prison in June 2017 after spending 16 months behind bars in Israel on corruption charges, even though his sentence was 27 months. He is the first Israeli prime minister to go to jail. Israeli-Palestinian negotiations were suspended in April 2014 after Netanyahu’s government refused to halt settlement building, recanted its commitment to release old detainees in return for signing the Oslo Accords in 1993, and rejected a two-state solution based on the state of Palestine within the 1967 borders with East Jerusalem as its capital. In the last months of Olmert’s tenure, there were intense negotiations with Palestinians in an attempt to reach a negotiated two-state solution, which the international community has demanded for decades. However, these attempts failed and Israel at the time blamed it on Abbas’s rejection of Olmert’s plan. On his second stop, in Dublin, Abbas met with his Irish counterpart Michael Higgins on Saturday at the presidential palace to discuss the US’s recent moves against Palestinians in the context of the so-called “deal of the century” — most notably relocating the US embassy to Jerusalem and recognising the holy city as the capital of Israel. Also, ending US aid and funding to UNRWA. Abbas briefed Higgins on conditions in the Palestinian territories, as well as Israel’s actions. They also discussed Ireland’s official recognition of Palestine. In December 2014, the Irish parliament issued a non-binding resolution urging the government to recognise the State of Palestine within the 1967 borders with occupied East Jerusalem as its capital. As Abbas embarked on his Europe trip, US Congress members urged President Donald Trump to reverse recent decisions against the Palestinian people and the PLO. On 20 September, 40 Congress members signed motions urging Trump to reverse his decision to block financial aid to Palestinian refugees and the Palestinian Authority (PA), hospitals in Jerusalem, and to close the PLO office in Washington. Ahmed Majdalani, member of the PLO’s Executive Committee who is close to Abbas, said that the move reflects “growing action in the US against Trump’s policies which are isolating the US in the global community and threatening its interests around the world”. Since Trump came to power in 2017 he has taken decisions that negate the national rights of Palestinians and gravely threaten the Palestinian cause, undermining key and longstanding principles, including recognition of Jerusalem as Israel’s capital, relocating the US embassy to the occupied city, ending funding to UNRWA and changing the criteria of recognition of refugee status to reduce their number from more than five million Palestinians to only 10,000. Trump’s administration has also taken punitive measures against Palestinians because they rejected the anticipated “deal of the century”, most recently expelling the Palestinian Ambassador to Washington Hossam Zolmot, and his family, eliminating $10 million in funds to youth programmes and closing PLO bank accounts in Washington. Abbas’s trip coincided with a media war between Fatah and Hamas after conciliation efforts between the two failed. Sanctions by the PA on the Gaza Strip cast a long shadow on the Palestinian political scene, and his statements about his willingness to hold secret or public talks with Israel added fuel to the fire in the quarrel with Hamas. The group said Abbas continues to handle the occupation poorly, and his statements do not represent the Palestinian people. Qassem believes that “secret negotiations confirm that Abbas is always hiding something from the Palestinian people and political players. 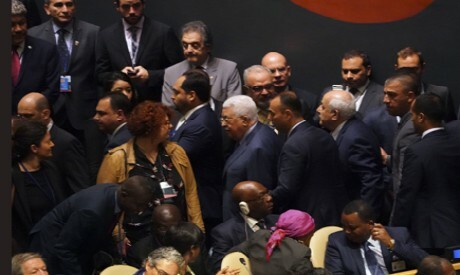 The Islamist movement said it does not support Abbas’s address to the UN on 27 September. Abu Zahra added: “What has the president of the PA left for our people to support him at the UN?” noting that decisions by the Central Committee and National Council of the PLO were not implemented. Fatah responded to Hamas’s claims, accusing the group of misleading and deceiving the Palestinian people. Fatah’s media and culture office issued a statement condemning the campaign by Hamas leaders against Abbas, saying it is similar to previous campaigns by the group during late President Yasser Arafat’s rule, at every crucial crossroads for the Palestinian cause. Fatah said that Hamas’s leaders have strayed from the correct path and fallen into the hands of the occupation and are blindly following and implementing the desires of the US and Israel, the masterminds of a plot to end the Palestinian cause. “Hamas sends messages to Trump’s administration and Netanyahu’s colonialist regime confirming they accept the deal of the century based on a state in Gaza under Hamas rule in return for an open-ended truce,” read the statement. Fatah said that the campaign against Abbas comes amid a critical political battle he is fighting on behalf of the Palestinian people around the globe, holding steadfast to the principles and goals of the Palestinian people, defending Jerusalem, Gaza and the right of every Palestinian at home or overseas to freedom and independence. In Israel, Chief of General Staff Gadi Eisenkot warned of “the growing possibility of violence in the West Bank” due to US measures and decisions on the Palestinian cause. The private television outlet Channel 2 reported that Eisenkot told a meeting of the security and political cabinet that “the possibility of violence erupting in the West Bank is between 60 and 80 per cent”. Eisenkot anticipated that Abbas’s UN address will be aggressive against Washington and Tel Aviv, and this will be reflected on the ground through an eruption of confrontations in the West Bank.